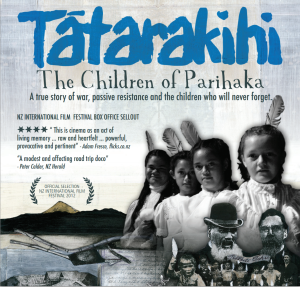 In 2009, a group of Taranaki children were taken on a bus trip to visit the places their ancestors, passive resistors from Parihaka in the 1880s, were imprisoned and forced to labour in. Places like Addington Jail in Christchurch and various buildings and roads they worked on in Dunedin. Along the way, they were welcomed at local marae by descendants of local Maori who supported the prisoners at the time. It was an emotional journey, documented by Paora Joseph’s camera and the children themselves. The narration is by the children, from their writing, poetry, song and art, expressed in a workshop after the journey. Children, known at Parihaka as “tatarakihi” (cicadas), after their chattering noise, have a special place in the village’s history. In 1881 the children of Parihaka greeted the invading Armed Constabulary with white feathers of peace, in accord with the philosophy of passive resistance taught by their two leaders, Te Whiti o Rongomai and Tohu Kakahi. Producer/director Paora Joseph: “While it recounts days of darkness, Tatarakihi – The Children Of Parihaka carries a sense of restoration and hope, and I hope it enables continued dialogue for understanding and mutual respect of both Maori and Pakeha in the New Zealand we know today.